Linda Swindling is the author of more than 20 books. Her most popular books include Ask Outrageously! The Secret to Getting What You Really Want, Stop Complainers and Energy Drainers, and The Manager’s High-Performance Handbook. The strongest relationships, top sales groups, and most successful organizations have one thing in common: people who have the courage to ask outrageously. This doesn’t mean being obnoxious or taking advantage of people. It means not compromising, taking a risk to get what you know you need, not what you think you can get. Based on Linda Swindling’s original research and her experience helping people make high-stakes requests in everything from business negotiations to marriage proposals, this book offers proven approaches to improve your asking and boost your chances of success. Whether you are a professional looking for a bigger opportunity, an entrepreneur striving to build a company, a nonprofit seeking funding, or simply a parent or friend wanting a more fulfilling relationship, it’s time to make that big ask! Get ready. Your results will surpass your greatest expectations! Turn constant complainers into productive contributors. Constant complainers take up resources, time, and mental bandwidth in the workplace. When you change a culture of complainers to one of contributors, you boost morale, increase productivity, and promote effective communication. In short, you get more done with less drama. In Stop Complainers and Energy Drainers, workplace communication expert Linda Swindling shares her expertise in negotiating tough situations in the workplace. Discover how to influence others to accomplish your purpose. 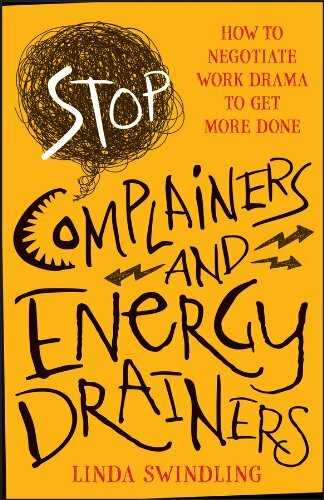 Stop Complainers and Energy Drainers uses scenarios, engaging questions, and survey results to provide strategies that can be implemented immediately. Locate and promote high-performance team members. Align with a common purpose and operating practices. Encourage a climate of collaboration, trust and innovation. Focus on and produce winning results. Create a personal action plan to fast-track your leadership. Are you ready for High-Performance? If so, buckle up ... start your engines ... and we ll see you and your team in the Winner’s Circle! When you work with the right people...those you trust...you learn acting with honesty and ethics is both preferable and profitable. Wintegrity takes intention, discipline, and the courage to do what's right. It's everyone's responsibility, at every level, all the time. This book offers guidelines to help you chart your route to success. Apply the tools and practices to steer clear of potential ethical disasters and help negotiate the situations you encounter. If this book is a map, your ethics are your compass. Just as you keep the needle heading towards true north; commit to doing what you know is right. This book will help you pay closer attention to your choices, or even correct them, to stay on course and reach your destination. Navigating with Wintegrity has a positive and lasting impact on your organization’s culture, on your industry, and ultimately, on society. Whether you are an employee, a leader, a client, a parent or a teenager, the principles and strategies can help you win in your personal and business relationships with integrity.